NEWINGTON – The town will join Americans across the nation tolling bells on Armistice Day Nov. 11. That day will mark one century since World War I ended in Armistice, as Germany, the U.S. and its allies negotiated a truce. The last surviving U.S. WWI veteran was Frank Buckles, who died in 2011 at age 110. Newington’s bells will toll at 11 a.m. Nov. 11 to commemorate the anniversary in remembrance of those who fought. This exercise is being led by the U.S. World War I Centennial Commission. There were four men from Newington who made the ultimate sacrifice in what is known as “The Great War.” They are: Howard George Davis, Clifford Earle May, Adolf Frank Stotzer and Charles Hoadley Tudor. 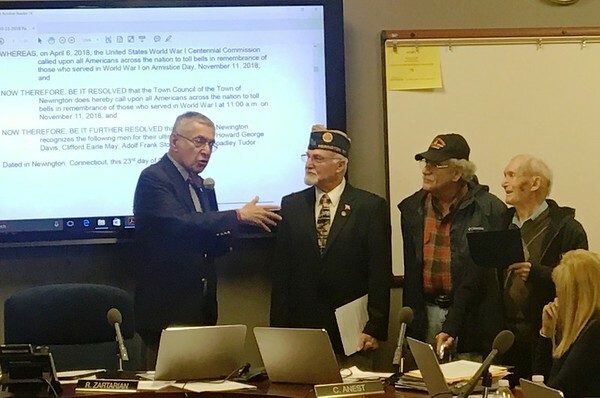 The Town Council recognized them at its last meeting, announcing the ‘Bells of Peace’ exercise with a proclamation, read into the record. Three veterans of other wars were invited to stand up and receive the honor on behalf of their fellow servicemen. The oldest was 95-year-old John Provini, who served in World War II. He was joined by Vietnam veterans Michael Fox and Sebastian Amatore, former commander of Newington’s American Legion Post 117. Amatore would like to spread the word that Newington’s Veterans Day Ceremony is also set for Nov. 11, at 12 noon in the Town Hall lobby. Council Deputy Mayor Beth DelBuono was brought to tears when the proclamation was read aloud. Several of her loved ones are veterans, including her husband. “When you sign up to serve, you are really signing a check that amounts to life,” DelBuono said. There were more than 4.7 million American citizens who served in WWI. More than 200,000 of them were wounded and 116,516, killed. 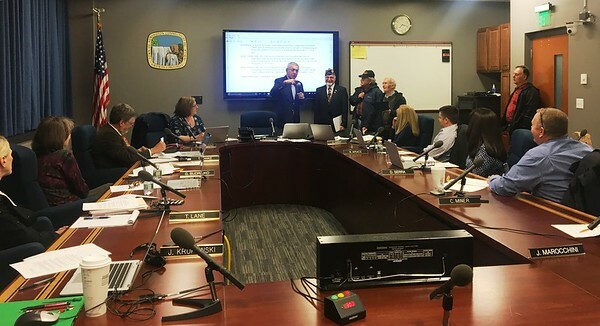 Mayor Roy Zartarian pointed out that the voting set to take place next week is one of many rights we have as Americans, defended by our servicemen. Councilor Diana Casasanta Serra said her father served in the Army for many years before retiring. “I thank you all for your service and anybody else out there who served,” she added. Gail Budrejko also took the opportunity to share why Veteran’s Day is a sacred holiday for her family. “As recently as six years ago my nephew died in the service,” she pointed out. Minority Leader Tim Manke urged residents to think of these sacrifices made for us as American citizens when sound fills the air next Sunday morning. Posted in Newington Town Crier, Newington News on Thursday, 1 November 2018 07:59. Updated: Thursday, 1 November 2018 08:02.